Have you ever seen pictures of cute toddlers cradling their newborn siblings, or giving them sweet kisses on the forehead? Adorable, right? And sooooo not my toddler. My husband and I thought that since Amelia is outgoing and was not much of a mama's girl to begin with that the transition from only child to older sister would go smoothly. Once Amelia figured out that this sleepy, poopy creature that takes away some of mom's time was here to stay she unleashed an epic whiny mode the likes of which we had never seen before. The new baby was public enemy #1, and everyone who held her or paid attention to her was dead to Amelia. As you can imagine, it was quite charming. Luckily, as we finish up week 3 of sister-mageddon, things are starting to look up. Clara is awake more which seems to delight Amelia, and Amelia has started asking about her when she is away napping. There were even a couple spontaneous kisses on the forehead the other day that almost made my heart stop. Hopefully things will continue to improve. In the midst of the sibling attention wars and round-the-clock feedings, slow cooker meals like this one are lifesavers. Thank heavens for nap time, because it is the only reason we are wearing clean clothes and ever have home cooked meals. 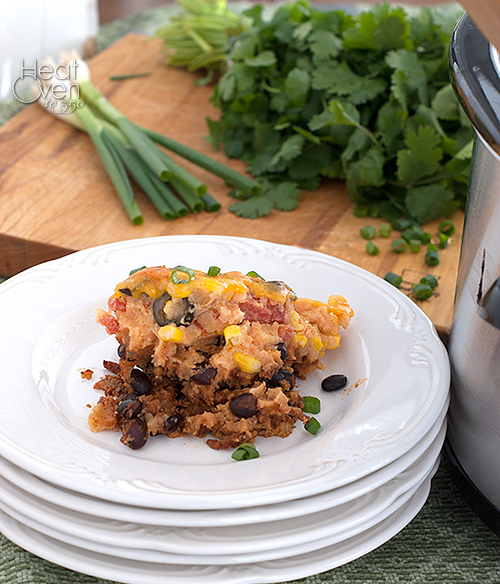 This tamale pie is easy to throw together and doesn't taste like your regular crock pot meal. In fact, it is more like a casserole than anything else, but we don't use that word in our house or my husband will not touch it. It isn't the loveliest dinner, but one bite and you'll be a fan. A slightly spicy meat and bean mixture is topped with a cornbread layer and the whole thing bakes in the slow cooker so it is wonderfully tender and the flavors meld. Add some cheese on top (because cheese makes everything good) and you've got an easy dinner that is ready no matter how busy things get at dinner time. Heat a large skillet over medium heat and add ground meat, onions and garlic. Cook, stirring frequently, until meat has browned. Drain fat and add chili powder, ground cumin and black beans. Stir to combine and put meat mixture in the bottom of a 5-6 quart slow cooker. In a medium bowl, combine cornmeal, milk, eggs, salt, cumin, corn, olives and tomatoes. Pour mixture over meat mixture in the slow cooker. Cover the slow cooker and cook on high for 3 to 4 hours. Sprinkle the cheese over the top of the tamale pie, cover and cook 10 minutes to melt the cheese. Total time: 4 hrs. 10 mins. Oh man, I remember those days. By about 3 or 4 months though, I was telling people "Having two is so much easier than having one!" because they just entertain each other, you know? 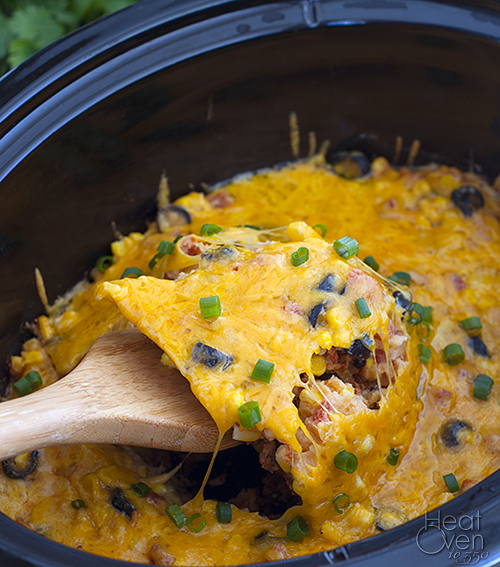 I love tamale pie but never thought to do it in the slow cooker! I'll be trying it soon! Oh man, my oldest gave up her nap the week we brought her little brother home from the hospital. It was awesome. Tamale pie is one of my favorite childhood meals, and I love that you made it in the crockpot. I'll definitely be trying this soon! Congrats on your little bundle! I promise it will get better, but until then, big hugs! Thank you! And wow, I can't imagine what I would do without nap time. Poor you! have you made a vegetarian one? I don't eat meat. Let me know if it can be made that way. It was so difficult the first few weeks after I brought home my second son. My oldest wanted nothing to do with me and it broke my heart! Luckily it doesn't last too long. :) Glad to hear things are smoothing out, and it sounds like Clara is doing just great! This meal looks delicious, Nicole…my kind of slow cooker meal!